Steven Spielberg | No Chic. Just Geek. Yes, I know, nothing says ‘welcome to this semi-humorous (mostly) film review blog’ like a quote about self-slaughter from a mediaeval theologian. But bear with me, for Easter is just around the corner, and if we’re going to do religion, then what better time? We are, if nothing else, about to cast an eye over a film which is probably more concerned with Easter eggs than any other in history, and so surely there’s some kind of connection there, right? Oh well, please yourselves. Steven Spielberg’s Ready Player One has managed to swing the coveted Easter weekend release for this year, although this may be less to do with the thematic connection than the fact there isn’t a Fast and Furious movie out this year. Certainly, were it not for Spielberg’s involvement, and the fact the film’s had $175 million spent on it, you might not expect it to get such an honour, for it is after all a computer game movie, not a genre with the most distinguished pedigree. Ready Player One isn’t quite in the same category, being a film about playing computer games rather than an adaptation of one. There is a lot else going on here too, though, including some dystopian SF and something rather new which I haven’t really seen in a movie before (we will come to this in time). The film tells the story of Wade Watts (Tye Sheridan), a teenager living in a sort of poverty-stricken demi-monde of 2045 following various ecological and financial disasters (well, as poverty-stricken as is compatible with everyone having top-end gaming and computer gear in their shacks, anyway). The real world is so thoroughly grim that everyone has retreated into a virtual-reality fantasy called the Oasis, where they can live out their dreams and be and do whatever they want. Well, Steven Spielberg may be 72 this year, but he has lost none of his ability to wrangle a giant popcorn blockbuster, and with Ready Player One the great man is on magisterial form: the story is told with assurance, impeccably paced, and with stormingly good set-pieces at exactly the moments when they’re needed. I found it to be an almost irresistibly entertaining film, judged simply as an adventure and a piece of pure spectacle. That said, of course, there is a lot of other stuff going on here. The actual story is not especially innovative, being a quest for plot coupons with various twists and reversals along the way, and most of the incidental fun of the movie comes from the fact that elements from a vast number of movies, TV shows and films exist in parallel in the Oasis. There’s a car chase near the top of the film in which one character is driving the DeLorean from Back to the Future, someone else is riding the iconic bike from Akira, and a third person is behind the wheel of the 1960s Batmobile, all of which are being pursued by King Kong. In a battle scene, people variously whip out colonial marine pulse-rifles, the Holy Hand Grenade of Antioch, or the glaive from Krull. 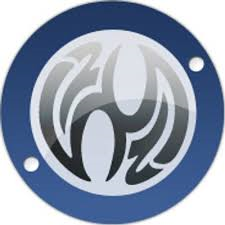 At one point there is a brief appearance by a big name member of Toho’s monster stable. It goes on and on and on (though there are certain predictable exceptions – nothing from Marvel, obviously, and the most recognisable thing from the stellar conflict franchise in the movie is Ben Mendelsohn). Now, I am aware that some people have already taken Ready Player One to task over this, claiming the movie embodies the worst kind of geeky fanboy attitudes – basically, if you don’t have a vast knowledge of popular culture, you are only worthy to be scorned and pitied. The fact that this may actually be pushback against the attitude, still quite prevalent in society in general, that geeky fanboys are the ones who deserve scorn and pity doesn’t appear to have occurred to some people. From here they tend to roll on to what is perceived as another problem with the film – namely, that it has a white male heterosexual hero, which is apparently practically anachronistic in a post-Wonder Woman, post-Black Panther world. I think this just sounds like people being determined not to like the film: it has very contemporary ideas about the fluidity of race and gender (who you are in real life doesn’t have to have anything in common with your virtual avatar), and it’s made clear that Wade only succeeds with the help of his very diverse group of friends. What no-one seems to have really picked up on is what seems to me to be a genuine case of the film trying to have its cake and eat it. The central conflict is basically posed as one between free-spirited, iconoclastic, rebellious youth on the one hand, and massive, ruthless, profit-obsessed corporations on the other, with the kids obviously in the right. Well, fair enough, but the movie is being distributed by Warner Brothers, which made $31 billion last year, and is not noted for being a humanitarian charitable foundation: if they genuinely believed that high-end entertainment should be free to all, we wouldn’t have had to pay over twenty quid for our tickets (after taking concessions and my freebie card into account). And yet we did. Well, this isn’t the first film to be hypocritical about big business, but it is emblematic of the way that Ready Player One comes on all street and revolutionary and ends up simply being rather timidly conventional in its attitudes. There is nothing genuinely surprising or unusual about its message or attitudes – in the end the characters decide that everyone should spend less time in the Oasis, because the only really real thing is reality (profound stuff, here – I’m surprised that Opus’ 1985 classic ‘Life is Life’ didn’t end up on the soundtrack, the period is certainly right). What’s going on here is something fairly typical of films about VR and the like: the ultimate message that this can only ever be a poor substitute for the so-called ‘real world’. A really subversive and possibly much more interesting ending would be one akin to that of Brazil, with everyone retreating into their own personal solipsistic fantasies, leaving the real world deserted but for humming consoles and comatose gamers. But modern culture is ultimately as concerned with the preservation of social order as religion was centuries ago, and just as Saint Augustine was at pains to point out that suicide won’t get you into heaven (otherwise there is the risk of true believers topping themselves just to cut short their time in an imperfect world), so these days films and books about VR seem obliged to stress that they can only ever be a distraction, simply because someone’s got to do the work to keep the real world running. In Ready Player One, this sudden emphasis on the priority of the real world comes as a crunching gear-change given we’ve just sat through over two hours of the Oasis being depicted as a miraculous utopia where dreams can literally come true, but it’s no less than what you would expect in a big mainstream movie like this one. It meets its social obligations with due diligence – but fortunately, Spielberg is also around to make sure it more than passes muster as a piece of entertainment, even if it isn’t as challenging as any of the episodes of Black Mirror it occasionally resembles. A big, shallow pool of a movie; lots of fun to splash around in, assuming you’re familiar with the water, anyway. I’m almost ashamed to admit it, but I’m getting a little bit tired of having to start virtually every new film review by talking about the ‘unique moment’ which America and the rest of western society currently seems to be going through. Maybe this is not in fact a moment; maybe things really have undergone a permanent and fundamental change, one way or another. I would submit it is really too early to tell. Nevertheless, it certainly seems to be the case that Hollywood believes a unique moment is in progress – based on the films that are coming out in time for this year’s awards season, where being the right kind of bien pensant is a reliable route towards success. Then again, exactly what is this moment which I can’t seem to stop going on about? Is it the Trump moment? The Weinstein moment? The Black Lives Matter moment? Are these separate things or all facets of the same thing? Once again, I think it’s really too early to be sure, but having a good go at making an oblique comment on several of these topics is Steven Spielberg’s The Post – the unusual speed with which Spielberg got this production together and into cinemas revealing the extent to which the director believes it’s a topical movie. And maybe it is, for all that it is mainly set in 1971 and concerns the Vietnam War. The title refers to the Washington Post, which as the story starts is generally regarded as a local, family paper, published by Katharine Graham (Meryl Streep), who for most of her life has been a society hostess rather than a businesswoman. Rather more experienced and pugnacious is her editor, Ben Bradlee (Tom Hanks), a career newsman constantly on the lookout for a major scoop. And when one comes, it is to their competitors at the New York Times: a disillusioned government analyst leaks papers relating to the US government’s involvement in Vietnam and the fact that the war was deemed unwinnable by the mid 1960s. Richard Nixon’s White House immediately takes out an injunction against the NYT, stalling publication on the ground this publication is a threat to national security. But the newshounds of the Post have also been on the case and indeed managed to track down the source of the leak, getting their hands on thousands of pages of classified documents with the potential to seriously embarrass every American administration going back decades. However, the Post is also undergoing a stock market flotation and a potentially controversial, perhaps even illegal move like this is guaranteed to scare the investors. Bradlee is certain that the Post should publish; Graham’s lawyers and most of the board of the company are equally convinced this will be a disastrous move. So which way is Katharine Graham going to jump…? Well, you can probably guess the answer, all things considered, and it is to Spielberg and his writers’ considerable credit that he has managed to make a gripping and pacy thriller out of a story where the conclusion is never particularly in doubt. Then again, the film is not so much about the story as it is about the message, which is one about the importance of freedom of the press and its role in holding the powerful to proper account. On top of this, the movie manages the neat trick of attaching itself to two current causes celebre, by also managing to say something about the place of women in society, too. Quite apart from the fact that both Graham and Bradlee were to some extent Washington insiders who had to choose where their loyalties truly lay, the film also makes much of the challenges she faces trying to be taken seriously as a businesswoman: during key moments of challenge she is literally surrounded by men, in a hardly accidental piece of composition, and equally finds herself with an honour guard of young women in her moments of triumph. Of course, as this is a movie directed by Steven Spielberg and starring Tom Hanks and Meryl Streep, you know it is going to have a certain heft and quality about it. Spielberg works his usual magic of taking a story which could have been a little dry and portentous and making it accessible, funny, and actually quite thrilling in places. 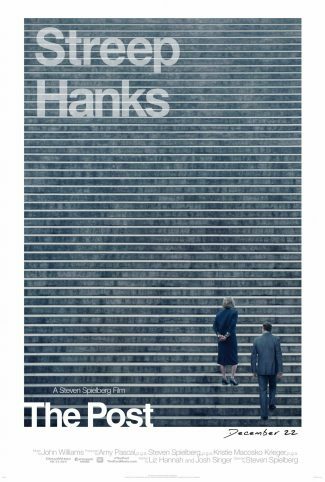 Hanks in particular is on top form, but Streep is also doing good work (not at all over-rated, on this evidence), and there’s an ensemble of fine actors further down the cast list, including people like Bradley Whitford, Alison Brie, Bruce Davison and Sarah Paulson. There is a tendency for films dealing with big events in recent American history to come over here and feel slightly incongruous, largely because the events depicted have no resonance for British viewers – a recent example would be Detroit, which appeared accompanied by a stentorian ‘It’s time we learned the TRUTH!’ ad campaign, to which my response was, ‘the truth about what, exactly?’ The Post manages to evade this pitfall, partly by dint of its superior storytelling, partly through focusing on more universal issues of truth and freedom. Sometime members of the current American administration have occasionally referred to the media as the real opposition party, and it may be they have a point. The Post is essentially the heaviest of Hollywood heavyweights coming together and making a point about what the United States is supposedly about, and it’s as effective a statement as you might expect. This movie concludes with the beginning of the end of the presidency it depicts, and if it doesn’t wind up playing a role in bringing down Trump, it won’t be for want of trying. ‘Madness conquers Hollywood!’ said the poster for the French release of Steven Spielberg’s 1979 film, 1941. It’s a bit unclear as to whether this is a description of the plot of the movie or a criticism of the thought processes involved in the thing being made in the first place; it’s arguably equally accurate as both. This is the early Spielberg movie that most people don’t think of and haven’t seen, and the one that tends to be described as a failure despite the fact it made nearly $100 million at the box office (three times its budget). Personally I always think of the film as a kind of folie de grandeur, for want of a better expression: it’s deeply mystifying that a film like this one ever got made, but I’m very glad it was. Stanley Kubrick said the biggest mistake Spielberg made with 1941 was telling everybody it was supposed to be a comedy, and the film certainly doesn’t start like one, with a mock-grave caption describing the somewhat febrile mood of panic and tension gripping the United States in the days following the Japanese attack on Pearl Harbour in December 1941. It soon becomes apparent that this is absolutely not your typical Spielberg film about the Second World War – a young woman out for a swim in the Pacific Ocean off the southern Californian coast is startled to find a Japanese submarine surfacing beneath her – not only is the scene directed as a spoof of the opening of Jaws, but John Williams reuses the theme from that movie, and it’s even the same actress (Susan Backlinie). We then proceed to a scene between the commander of the sub (Toshiro Mifune) and a German advisor (Christopher Lee) discussing their situation (in Japanese and German respectively) and the commander’s desire to strike at a significant target in the continental US so they can return to Japan with honour. Both these movie legends play the entire film almost completely straight, no matter what else is going on around them (in this scene, for instance, there is a naked woman clinging to the periscope above them while they talk). It certainly makes a change from the gurning and screaming which is the preferred style of performance of nearly everyone else in the film as it goes on. Well, anyway. 1941 has a huge number of characters and nearly as many subplots. In addition to Mifune and Lee trying to work out where their sub is and deliver an appropriately crushing attack on America, the film also concerns a young man trying to stop a soldier from stealing his girlfriend, an unhinged fighter pilot (John Belushi) trying to track down non-existent Japanese planes, a mild-mannered homeowner who has an anti-aircraft gun deposited in his garden by the army, an army officer trying to lure his superior’s secretary into a plane for, ahem, personal reasons (she is an aviophiliac, for want of a better word), and a motor pool sergeant (Dan Aykroyd) and his crew who are trying to maintain some kind of order. Courtesy of some ingenious plotting (the script is by Bob Gale and Robert Zemeckis, who of course went on to write Back to the Future), all these elements bounce off each other as the film proceeds (it essentially takes place within a single day) and the situation in Los Angeles gets more and more chaotic. It is, if anything, a disaster movie played for laughs, having the same kind of structure – the difference being that here the disaster is largely self-inflicted (the first time I saw Independence Day, itself an heir to the 70s disaster tradition in many ways, I remember thinking ‘This reminds me of 1941‘, and I was not the only one to spot the resemblance). 1941 takes all the technical advances of late-70s cinema and puts them to the purpose of trying to be funny. Set in 1941 and made in 1979, this movie is of course now closer to the time it depicts than the present day, and it is perhaps inevitable that it feels a little dated in some ways. Much of the comedy is of a broad, early Saturday Night Live kind, unsurprisingly given Belushi and Aykroyd found fame on SNL – there is a lot of Belushi’s bull-in-a-china-shop slapstick, in particular. There is a wilful irreverence about the war in this film which is not at all what one would expect, and which indeed made it somewhat controversial at the time – Spielberg offered John Wayne a role in it at one point, and Wayne not only refused but told him he shouldn’t make the film at all as it was un-American and unpatriotic. With Spielberg so well established as a Hollywood grandee these days, it’s fascinating to revisit a time when he was still a subversive young rebel. In other ways, of course, this is very recognisably a Spielberg movie – there is music from John Williams (he contributes one of his more rousing marches), a strong sense of nostalgia, and of course the usual technical mastery. The appearance of Backlinie, reprising her role from Jaws, isn’t the only in-joke in the film, either – Lucille Benson appears in virtually the same role she had in Duel, made nearly a decade earlier, playing a gas station owner saddled with an awkward customer. Perhaps it’s this sort of thing which has led many people to label 1941 as self-indulgent – Spielberg, fresh from the massive success of Jaws and Close Encounters, being given carte blanche to do whatever he wanted, with the result being an overblown mess (‘Spielberg playing with cinema like a child with a toy train set’ was one comment). I don’t think it’s remotely fair to call 1941 a mess, for it manages to tell a complex story with a minimum of confusion. If there is a problem with the film, it’s that it’s a comedy which is not very funny – at least, not consistently. There’s a relentless, manic quality to the film which eventually becomes a little exhausting rather than completely enjoyable, and it does require you to accept that the characters do absurd and ridiculous things for no other reason than that they’re supposed to be funny (a character on air raid warden duty takes a ventriloquist’s dummy with him). It almost anticipates Airplane! in its belief that if you bombard the audience continuously with jokes, enough of them will be funny for the film to succeed – and I suppose this is true, for this is a movie which never fails to entertain me. 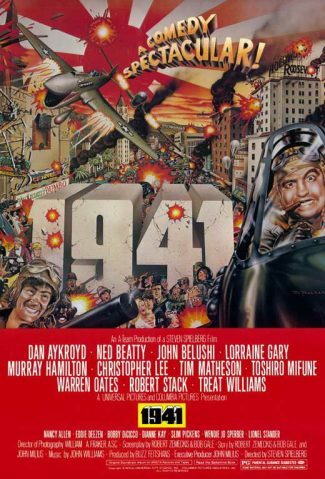 This may partly be because I just enjoy the fact that so much talent and so many resources have been devoted to bringing such an absurdly silly story to the screen, but as well as being a lavish piece of movie-making, 1941 is filled with colour and movement and action. The hectic pace may be a problem, but if the film slowed down for a moment it would surely fail entirely. As I say, 1941 is a film I have always liked, even if Spielberg considers it to have not completely worked, and steered clear of comedy as a result (a shame, especially as he was supposedly planning to do a movie with the Goodies before this one came out). It’s hit and miss as a comedy, but as a technical achievement and above all as a spectacle, it has lots to offer. The business of proper big-screen revivals of classic movies can be a funny old thing sometimes. It’s quite normal for the two slightly art-housey cinemas in my area to regularly show something like The Graduate or West Side Story of a Sunday afternoon, the main selection criterion seeming to be that the film is just old and good. In terms of an old movie getting a more general showing, well, having a major anniversary certainly seems to help. Even so, things are often not quite as one would expect: if you’d asked me which blockbuster Hugo-nominated fantasy film would be getting a spruced-up revival for its fortieth birthday in 2017, my first guess would not have been Close Encounters of the Third Kind. 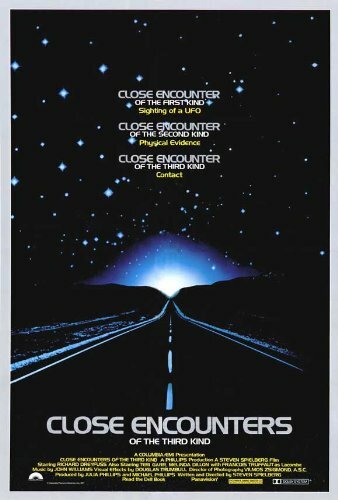 Close Encounters, directed and (in theory – many hands were involved) written by Steven Spielberg, is one of those movies which has shifted into the cultural background somewhat over the years, no doubt as a result of its ideas, themes, and images being so extensively reworked in other venues. Long before seeing the actual movie, I remember watching the parody of it on The Goodies (Bill Oddie, in a Superman costume, playing a trombone duet with an alien spacecraft), and not being at all confused by the various references. Hard to imagine The X-Files without Close Encounters; impossible to imagine E.T. the Extra-Terrestrial at all, for obvious reasons. The film opens on a black screen, over which an unsettling wail of white noise rises, before a smash cut to the heart of a sandstorm. One group of the film’s protagonists emerges from this: Lacombe (Francois Truffaut), a French scientist, who meets a group of American colleagues. Together they make a disturbing discovery: a flight of torpedo-bombers has been deposited in the Mexican desert. The planes seem to be a squadron that disappeared off the coast of Florida in 1945, but they appear to be brand new, as though thirty years has not happened. A witness speaks of the sun rising in the middle of the night and singing. More strange phenomena occur over Indiana: strange lights in the sky are reported by airline pilots. A blackout spreads across the countryside. Electrical engineer Roy Neary (Richard Dreyfuss) leaves the domestic chaos of his home in an attempt to track down the source of the power cut – he is an ordinary guy, a little harassed, but generally happy in his life. Then something happens to him on a lonely country road in the middle of the night that changes everything. He encounters a UFO, which wreaks havoc with his truck and gives him severe sunburn before heading off. Neary goes in pursuit, encountering others who have had similar experiences. Amongst these are Jillian Guiler (Melinda Dillon) and her infant son, who were visited in their home by an unseen presence. A flight of several UFOs swoops by, hotly pursued by the cops. Neary’s world has been transformed. From here the movie follows both Lacombe and Neary. Lacombe is a scientist, following a trail of evidence: long-since-disappeared ships return, in rather improbable locations. From India there come reports of strange noises from the sky. Signals are received from deep space, providing map co-ordinates. Government preparations are made. Something is coming to Earth. Close Encounters is part of that sequence of early movies which established Spielberg as probably the most famous and financially successful director in the world – Jaws, Close Encounters of the Third Kind, Raiders of the Lost Ark, and E.T.. (Rather more obscure is his 1979 knockabout comedy film 1941, which was less successful but which I find very hard to dislike. Apparently the experience burned Spielberg when it came to doing pure comedy, which is a shame, as legend has it his next project was going to be, almost unbelievably, a big-screen blockbuster movie version of The Goodies. Strange how all these things link up together in different combinations.) Of all of them, Close Encounters is the one which has slipped furthest from the public consciousness, perhaps in part because it hasn’t been sequelised or exploited to death, and also because it has to some extent been eclipsed by E.T.. The similarities between the two are obvious – the relationship between Neary and Lacombe clearly parallels that of Elliot and Keys in the latter film, which had its earliest origins as a Close Encounters follow-up – but it seems to me that Close Encounters is a rather subtler and more thoughtful film, in addition to being less sentimental and cutesy. It feels much more of a piece with other films being made in America in the mid-to-late 1970s, when the country was still trying to process the tarnishing of the government in the Watergate affair and the implications of the conclusion of the Vietnam War. People were looking for something that would allow them a chance to escape, and perhaps even give them something to believe in, and it seems significant to me that so many of these late 70s and early 80s films conclude with an explicit act of faith on the part of the protagonist – switching off a targeting computer and relying on instinct, or averting their eyes from the wrath of God. Close Encounters of the Third Kind is perhaps the fullest realisation of this theme of all of these films, for it is surely primarily about the finding and following of faith. I find it now a little ironic that my parents are fond of declaring that E.T. is actually some form of Christian allegory (they said the same about the first stellar conflict movie for a while, if memory serves) – for one thing, Spielberg is not exactly noted for his Christian background. But Close Encounters does have that spine-tingling sense of human beings coming into contact with the deeper mysteries of the universe, and so often the imagery used is religious: there are signs and portents in the sky. A ship appears, ark-like, in the middle of dry land. When John Williams’ famous five-note motif first appears, it is as a mantra, endlessly chanted by what appears to be a choir of Indian mystics. At one point Roy Neary demands of the sky what all of this means. Neary’s story itself practically qualifies as a conversion narrative: he’s an Everyman, transformed into a true believer by a chance encounter. From this moment on he finds he has no other choice than to follow his new faith, despite the efforts of friends and the authorities to dissuade or convince him otherwise. He loses his job, and his wife and family leave him too (the movie is perhaps a little hard on Neary’s wife, played by Teri Garr). But he presses on, makes his pilgrimage, and in the end it appears to be him, the true believer, who is chosen ahead of all the government-approved candidates to be taken up into the heavens by otherworldly forces. (The sensation is presumably one of pure rapture.) Spielberg has said that he now finds it unimaginable that Neary could abandon his children and go off into space, but in the context of the movie, and given its theme, it would feel very strange if he didn’t: the movie is about shedding those kinds of Earthly connections in favour of the spiritual kind. That said, it’s not a cosy or sentimental spirituality: Close Encounters‘ aliens may be otherworldly, but they are also enigmatic and strange, and often frightening as a result – the visitation of alien forces on Jillian in her home is a genuinely frightening sequence, rather at odds with the rest of the movie. (Almost enough to make one regret the fact that Spielberg hasn’t really directed a horror movie since Jaws; one imagines it would be utterly terrifying.) There is a real sense of the unknown and perhaps unknowable touching life on Earth. Spielberg’s casual mastery of cinema is already well-developed in this movie, which includes several of his most memorable bits of legerdemain – the moment where the lights in Neary’s rear-view reveal themselves to be not headlights, but something rather more exotic, for one, and the one where a TV set in the foreground flashes up an image replicating the vast sculpture dominating the room behind it, for another. He also manages to keep a film which could easily have become a bit airy and earnest grounded and accessible, inserting many bits of humour and action. Not that he gets everything completely right – quite apart from the handling of Mrs Neary, one is struck by the sheer number of people (virtually all men) at the Devil’s Tower arena who seem to have nothing to do but stand around looking on in awe: spectacle trumps logic here, I suppose. Fairly prominent in the crowd is a young Lance Henriksen – there’s a guy with an interesting CV – and also J Allen Hynek, the formulator of the ‘close encounters’ scale (which never gets elaborated upon in the actual movie, oddly enough). The late 1970s and early 1980s have left us with a lot of significant SF and fantasy movies, not all of which get the attention they deserve. Close Encounters of the Third Kind is probably the least action-adventure oriented of all of them, and the least escapist (as escapism is generally understood, anyway). It’s also much more obviously a film about personal themes, but one which handles them in a very accessible way. That it manages all this while still looking very much like a modern special-effects blockbuster is by no means the least of its achievements. Probably not Steven Spielberg’s best film, perhaps not even the best of his early films – but still a significant one, and worth remembering. Good to see it back on the big screen. Some people mark the turn of the year by observing the flight of birds, the passage of the seasons, and the signs to be drawn from the sky. I, on the other hand, prefer to keep track of what’s on at the local cinema and take it from there. Currently we are receiving a range of seasonal movies, plus what I can only describe as quality blockbusters. Christmas may be here soon, but – I am certain – film industry types are more concerned by the fact that awards season isn’t that far behind it. It occurs to me that the kind of film which aspires to win Oscars isn’t anything like as certain a commercial bet as the typical big dumb derivative summer blockbuster. It’s a measure of how important critical respect is to the major studios that every year they sink millions of dollars into films like Foxcatcher – a true-life crime story about Olympic wrestling, not traditionally a commercially popular subgenre – and various other worthy and high-minded projects, when they could be doing more superhero movies and remakes with a more guaranteed profit margin. These films do constitute a gamble – the ones that win major awards will receive a push at the box office as a result, but the ones that don’t may struggle. 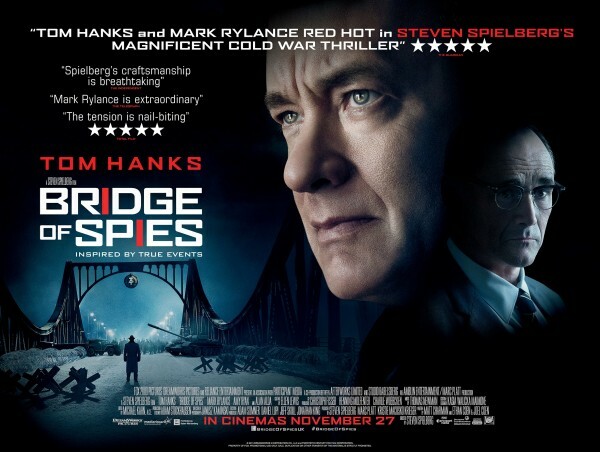 Then again, sensible studios invest wisely: which brings us to one of the first quality blockbusters off the blocks this year, Bridge of Spies. You can’t always judge a film based on the names of the key personnel, but any film starring Tom Hanks, directed by Steven Spielberg, and co-written by the Coen brothers must have something going for it, surely? The story opens in late 50s America, with the Cold War at its height and espionage enthusiastically pursued by both parties. One such Soviet agent, Rudolf Abel (played by Mark Rylance), is captured by the FBI in New York, and put on trial for his activities. It is politically important that Abel is seen to be given a fair trial, and given the awkward and unpopular job of defending him is Jim Donovan (Hanks), an insurance lawyer. Donovan does his best but it quickly becomes clear that he has been retained simply for the purpose of keeping up appearances – and no matter how token a figure he is, it doesn’t stop his family from being on the receiving end of hostility from other American citizens who see him as a Communist sympathiser. There’s a magical experience which happens too rarely at the cinema – that moment when you suddenly become totally assured that you are watching a film made by people who completely understand what they’re doing, and that as a result you can just relax and sit back, safe in the knowledge that you’re in for a piece of superb entertainment. I am happy to say that I had one of those moments very early on in Bridge of Spies. This is possibly even more noteworthy given that this is – in theory at least – a thriller, but one where many of the scenes concern middle-aged men having complicated discussions with each other in various offices. There are virtually no action sequences worthy of the name, and to anyone with a reasonable grasp of modern history the conclusion of the movie should hold few surprises. And yet Spielberg has managed to make a film which is both gripping and genuinely entertaining. Early on in his career, Tom Hanks was whisked off to have his photo taken with an elderly James Stewart, which if nothing else displayed remarkable prescience on the part of the publicist involved: Hanks is the closest thing modern American cinema has to Stewart, no-one else can project that kind of everyman quality while still remaining a star, no-one else can do quiet decency in quite the same understated way. Hanks is on top form here – he is basically playing the conscience of America for most of the film, but he does it without once seeming hokey. What’s also very special is the relationship between Donovan and Abel and the bond that develops between them. Rylance takes an incredibly introverted and phlegmatic man and turns him into a memorable character, and the scenes between him and Hanks are captivating: it’s deeply thrilling to see the great American movie star and the brilliant British stage actor bringing their different styles to the film, and watching them combine so flawlessly. Then again, there’s barely a single dud performance in the entire film – the minor characters Hanks encounters on his mission are all wonderful little miniatures of writing and performance, each one memorable in their own way. Turn of the 60s America and Germany are both painstakingly recreated, and Spielberg eschews flashy look-at-me directing in favour of simply telling the story. There is, I suppose, a sort of God-bless-America-aren’t-we-wonderfulness to some of the scenes in this film, which some viewers may find a bit difficult to stomach – in a less-accomplished film, it might not sit easily in a story which to some extent is concerned with the way in which American realities do not live up to American idealism. And, given the nature of the story, this is primarily a fairly talky film about middle-aged men discussing the politics of five and a half decades ago. Nevertheless, as far as this sort of film goes, Bridge of Spies does it superbly – it’s hard to imagine how it could be any better, to be honest. It’s a film that deserves to do very well at the box office, regardless of how many rewards it picks up, and I hope it gets the success it deserves. Well, I don’t know about you, folks, but to me that sounds less like a working method than a description of some sort of disorder, but hey, it clearly works for Mr Picky as he won his third leading-role Oscar last week. Come on, Marvel, get him on board for the Avengers sequel or whatever! I’d like to see him try method-acting Thanos or the Abomination. Anyway, as a conscientous sort of chap who cares about his readers I thought it behooved me to go along and actually have a look at Day-Lewis’ turn in Lincoln, and as a purveyor of cheap jokes I worried that a lengthy biopic about the American Civil War and human rights might be a bit short on laughs so I took my trusty Comparison Wrangler with me (apparently he has some sort of Illinois heritage and, as a result, a personal connection to Lincoln – I believe that, in his lawyering days, the 16th President failed to get one of his ancestors off a parking ticket, or something). I must confess to being more startled than usual by this latest gem. ‘Explain,’ I eventually managed to request. Believe it or not, I do go to the cinema with this guy out of choice. I can’t honestly endorse his appraisal of Spielberg’s film, though. This is one part historical portrait to two parts political drama, notably lighter on martial arts vampire fighting than last year’s somewhat similar Lincoln bio-pic. The bulk of the film occurs in the space of a few weeks early in 1865. Lincoln has just been re-elected as US President, which is good, but the Civil War is in its fourth year, which is bad. That said, the Confederacy is virtually exhausted, which again is good, but Lincoln has not yet managed to get the US Constitution amended to outlaw slavery, which is also bad. For various political reasons it is absolutely vital that the amendment be passed by the House of Representatives before peace breaks out, but in order to do this Lincoln needs to manufacture a two-thirds majority which he simply does not possess. Most of the film depicts Lincoln’s various endeavours to cobble together the majority required, which results in a number of plotlines going off in various directions – a fervent abolitionist played by Tommy Lee Jones has to be persuaded to moderate his position in order not to frighten the metaphorical horses, a dodgy political operator played by James Spader is retained to get votes from Lincoln’s Democratic opponents by offering sinecures, peace overtures from the South have to be carefully finessed, and so on. As I’ve said before, I’m not a great expert on American history, and my knowledge of their political system mainly derives from early seasons of The West Wing, but I found this all to be fascinating, challenging stuff, and I did come away wanting to learn more about the history of this period. 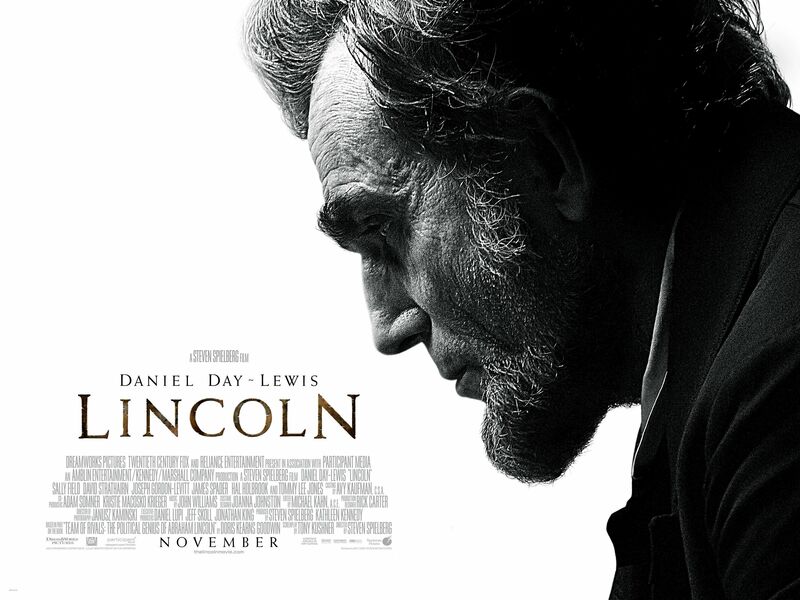 Less successful, I thought, was material concerning Lincoln’s relationships with his various family members – Mrs Lincoln is played by Sally Field, who to be perfectly truthful I like less than Mary Elizabeth Winstead from the other movie, and Lincoln’s eldest son is played by Joseph Gordon-Levitt – cue the inevitable whisper of ‘Hey, it’s Batman!’ from the seat next to mine. If this stuff is here to try to humanise an iconic figure, or possibly portray him as a hero with feet of clay, then it doesn’t quite work, possibly because Spielberg’s heart isn’t quite in it. The film isn’t quite a hagiography of its subject, but it does have an aura of reverentiality to it, and while it’s by no means humourless, it is definitely steeped in gravitas. Daniel Day-Lewis is operating on full power as Lincoln himself, but – as usual – I found the results to be oddly mannered and ostentatious. His performances are always arresting and remarkable, but for me he never disappears into the character he’s playing: instead he straps the accoutrements of their personality on like some ornate suit of baroque armour. I found Tommy Lee Jones’ performance, which isn’t nearly so technically refined, far easier to relate to. But then this is clearly intended as a serious film on an important topic. Spielberg’s strike rate with this sort of thing is rather variable – and personally I prefer his films when they involve people being eaten by special effects – but this is certainly towards the top end of this section of his oeuvre, engaging, illuminating, crisply scripted, uniformly strongly played, and unflashily-directed. ‘Enjoyed’ is probably the wrong word for my reaction to Lincoln, but I certainly appreciated the skill that had gone into making it. Well, well: it looks like the wheels of Hollywood spin ever faster. It seems like only a few weeks ago that I was writing about James Gunn’s deranged vigilante movie Super (come to think of it, that’s because it was), and yet here we are with Super 8 already in theatres. The first six sequels somehow completely passed me by, I’m afraid, and to be honest I don’t quite see how the two storylines are connected, but never mind. 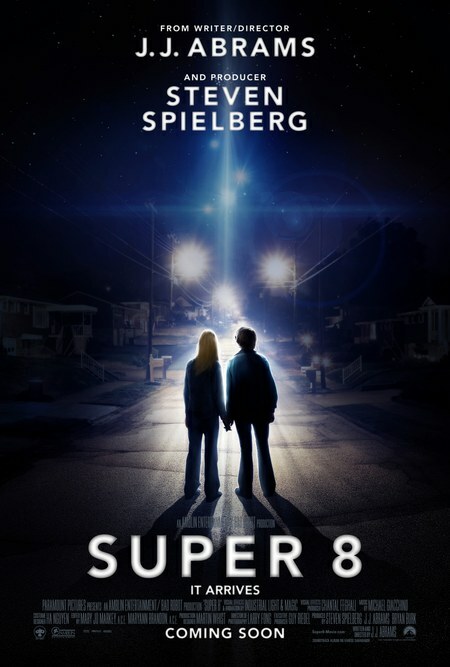 Super 8 is the greatest Steven Spielberg-helmed Stephen King adaptation ever made, which is rather odd given that it’s an original story written and directed by J.J. Abrams. Given Abrams’ history of doing violence to narratives (his own in Lost and to other people’s following what he did to Star Trek continuity), it comes as something of a surprise that Super 8 is a relatively straightforward story. Set in 1979, the main character is Joe (Joel Courtney), a teenage boy who, along with his father (Kyle Chandler), is struggling to cope with a recent bereavement. Joe finds escape in helping his friends make a super low-budget horror movie on a super 8 camera (hence the title of the movie). While secretly filming one night, the kids are witnesses to a spectacular train crash (and boy, is it spectacular! ), which litters the area with what looks like mysterious space lego. Beyond this, the most striking thing about the movie is its painstaking and almost wholly successful recreation of the atmosphere and style of the kinds of movies that Steven Spielberg was making three decades ago. This, so far as I can see, is the only reason why Super 8 is a period piece. Occasionally Abrams cuts loose with major CGI sequences – the train crash, and a few others I won’t describe in detail – but the rest of the time it’s all very low key and naturalistic, with nothing that couldn’t have appeared in a movie made at the time this is set. Abrams gets uniformly strong performances from a largely unknown cast and – his love of lens flare excepted – apes Spielberg’s own directorial style with great deftness. There’s an element of sweety-schmaltziness to some parts of this story that I found slightly overdone, while in other places there were elements I found a little bit too obvious. Despite all this, it’s an impressive job – quite what Steven Spielberg himself made of it (he is, after all, the producer of the movie) I can’t imagine. Presumably he took the homage in the spirit in which it was intended. At its heart, though, Super 8 is much more of a B-movie than anything Spielberg was making in the late 70s or early 80s. Deep down it’s more like a Stephen King story (not that there isn’t a considerable intersection between King and Spielberg on occasion). I am obviously loath to go into too much detail here, as the central mystery of the film is very carefully established and satisfyingly resolved. By the standards of modern blockbuster entertainment, Super 8 feels really rather small-time and restrained – very much a personal project. That said, it’s no less engaging or rewarding than any of the other major movies out this summer, and considerably moreso than most of them. Definitely J.J. Abrams’ most likeable and accomplished film to date.